We are Senior Advisors to the Overstreet Comic Book Price Guide and a Charter Member Dealer with the Comics Guaranty, LLC (CGC). For other wonderful items, make sure to visit us at our About Me Page. #44 Captain America Art by Sal Buscema. 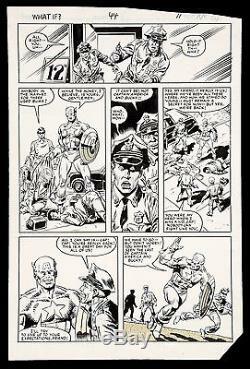 Original artwork for What if #44 "Captain America Were Not Revived Until Today" by Sal Buscema (pencils) and Dave Simons (inks). And Bucky clean up the thugs for the astonished police officers who are more than pleased to see their idol back in action. Nice full figure images of Cap. Art is in excellent condition with image size approx. The item "What if #44 Captain America Art by Sal Buscema" is in sale since Monday, June 19, 2017.